Are you looking for an apartment for your family in Sunny Isles? You may then have a sneak peek into the Jade Beach condominium, which is well known for its fabulous location with proximity to schools and a safe overall environment besides its oceanfront feature. Without any doubts, Jade Beach apartment is one of the best condominiums in Sunny Isles Beach and living there is a gift of life. Are you anxious to know the cost for various units? Although condos in this area could be very expensive, Jade Beach condo is fairly priced for an ultra-luxurious oceanfront community with all modern amenities. So, until you check out the inventory, you won’t be able to figure out which line suits you best. unit 1203, which has a direct ocean view, offers 862 square feet of living space under air, consisting of one bedroom and one bathroom. Unit 1006 at Jade Beach condo is available for rent or sale. It has 942 square feet of living space, with a bedroom and a bathroom. Its price is fixed at $945000. Unit 1903 offers 862 square feet of living space and its sale price has been fixed at $980000. It has a bedroom and one and a half bathrooms. Residents of these units at Jade Beach apartment for sale offer great unobstructed view of the ocean. Unit 804 offers 1927 square feet of living space, cutting out three bedrooms and three and a half bathrooms of the space. Find into this unit all floors covered with marble, designed with floor to ceiling glass when it offers exciting views of the ocean. The present asking price of this Jade Beach apartment for sale is $3500000. Apart from these features an apartment at Jade Beach condo offers, you will also find penthouses as available. So, if you want to live in true luxury with your family, this unit has all things to offer. Unit 2704 comes with fully furnished features with three bedrooms and three and a half bathrooms. 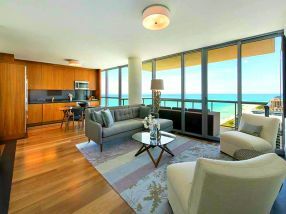 Asking price for this Jade Beach condo apartment is $2190000. This unit has marble floors and incredible city and ocean views. Contact our office today at (305) 336-0457 to arrange a private viewing and a tour of Jade Beach condo. Use our site – http://www.sunnyislesmiamirealestate.com/Sunny-Isles-Beach/Jade-Beach/ to analyze current market trends and choose the right apartment for you. Miami real estate is my passion, information technology is my profession. I've been one of the top luxury real estate specialists working in the Sunny Isles and Miami Beach area for the past 15 years. After serving as a Vice President of One Sotheby’s International Realty and managing my own office in Sunny Isles Beach, I decided to go on my own. If you are interested in purchasing or selling real estate in the Miami area, take the time to get in touch with Leon Bell today - call now (305) 998-9922.